Whether you’re a couple seeking a romantic retreat, a family looking for an unforgettable vacation for all ages, or a solo traveler seeking a tropical escape, you’ll find your dream getaway among our array of spectacular land vacations! With extraordinary deals from Air Canada Vacations, Sunwing, Transat, and WestJet Vacations, now is the perfect time to set that out-of-office and discover a new destination! Fly, roam, travel, explore… take advantage of these exceptional deals from Air Canada Vacations, Sunwing, Transat, and WestJet Vacations and fuel your wanderlust! It’s in the food you taste — supremely comforting with every authentic bite; the slender streets you wind through on scooter, girded by buildings frozen in time; and in every expansive, rolling vista that stops your breath. Things are simply different in Europe. Curiously, one of the things you’ll also find there among the abundance of iconic cultural touchstones is… yourself. Maybe you’ll find yourself treasure hunting on the outskirts of Paris at Les Puces de Saint‑Ouen, the largest antique market in the world. Or when you finally discover that Iceland is actually a verdant land of volcanic wonder and misty waterfalls. Or as you realize you can’t get a bad cup of coffee in Rome. Go ahead. Try. Of course, you may only find yourself when you grasp that there’s a decidedly European way of life — adult naps midday are met with favor here. Yes, even on weekdays. Wherever you meet yourself, you’ll quickly come upon the very best thing about the old world: it always feels new. Every. Single. Time. Find yourself. In Europe. 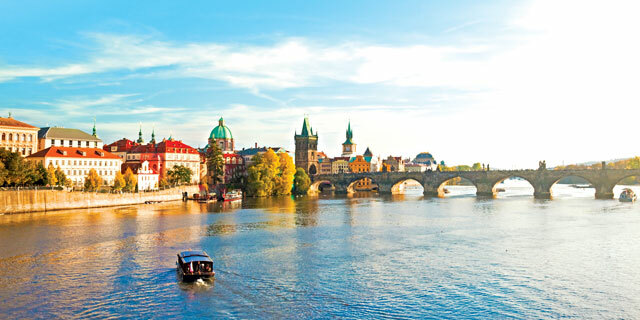 Air Canada Vacations has curated a collection of the very best year‑round European vacations. This means you can take advantage of more flexibility, more flights, and more experiences! The earlier you book, the bigger you save! Book 180 days or more prior to departure, and save $1,000 per couple, book 120 days or more prior to departure, and save $500 per couple1, and book 90 days or more prior to departure, and save $300 per couple2! Whether vacationers want to escape winter, spend March Break in the sun, or book a last-minute tropical getaway, they can save up to 40% on select all inclusive packages in sought-after sunny destinations across Mexico, Central America, and the Caribbean with Sunwing! Featuring a wide selection of properties in paradise, vacationers can choose to stay at a family-friendly resort, a beachfront boutique hotel, or an adults-only oasis. Travelers can escape weary winter weather and head to the warm shores of Cancun when they choose to stay at the brand-new Royalton Suites Cancun. Guests can look forward to an All-In Luxury ® experience with spacious suites featuring premium handcrafted DreamBeds™ and elegant facilities including several sparkling pools and trendy bars. Boasting unlimited reservation-free dining at delectable restaurants, guests can taste authentic Mexican dishes at Agave or experience world-class dining at the sophisticated Hunter Steakhouse. For an elevated experience, guests can upgrade to Diamond Club and take advantage of attentive butler service and other lavish perks including access to SkyClub ­– an adults-only rooftop pool, bar and restaurant offering unparalleled panoramic views. Families can spend March Break making memories in the sun when they choose to stay at Royalton White Sands in Montego Bay. Featuring top-notch facilities for all ages, families can spend sunny days at the water park going down waterslides or enjoy an array of daily activities including beach Olympics and poolside competitions. While mini-vacationers hang out with Max and Ruby at the kids club, adults can indulge in soothing treatments at the opulent Renova Spa or grab a drink at the sports bar. Riu Republica is a beachfront paradise exclusively for adults. This resort is an ideal destination for a last-minute tropical getaway, featuring a thrilling water park only and several pristine pools, some with stylish swim-up bars. Guests can choose from a wide selection of upscale specialty restaurants serving an array of cuisines such as Italian, Asian, and Spanish. Vacationers can also benefit from exclusive RIU-topia perks such as in-room liquor dispensers, unlimited reservation-free dining, spa credits and more. Book select all-inclusive vacation packages across the Caribbean, Mexico, and Central America with Sunwing, and save up to 40%! 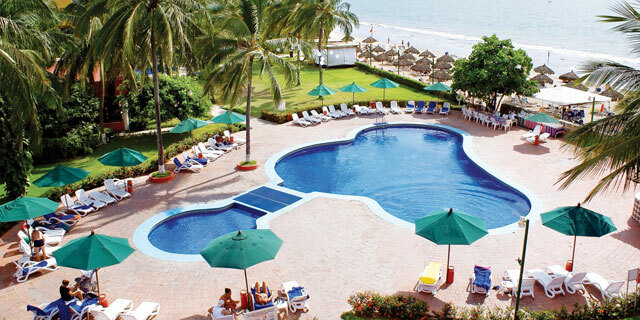 Be captivated when you vacation to Royal Decameron Complex, a Canadian favorite resort located on a beautiful beach in the small village of Bucerias in Riviera Nayarit, Mexico. This resort is perfect for both kids and kids-at-heart! Learn to scuba dive or plunge into activities galore, from kayaking to windsurfing to beach volleyball. Spend your days practicing your perfect swing at the nearby golf course, and feast on your favorite cuisines, from Brazilian to Thai to Mexican or seafood fusion. Take advantage of all-inclusive benefits when you stay at this resort such as à la carte dinners, daily activities programs, daily sports, disco (admission and drinks included! ), domestic drinks (unlimited, house wine included), evening entertainment, introduction to scuba diving in pool once per stay, selected international drinks, a buffet breakfast, lunch, and dinner, and service of a representative at destination! This resort is also part of the Solo Collection! The South is your oyster when traveling solo. Make new friends, blaze out of your comfort zone… or stay in it! The choice is yours because this is your vacation. Experience and see the benefits of Solo Collection at this hotel. Book a vacation package to Royal Decameron Complex in Riviera Nayarit, Mexico with Transat and save up to $500 per couple! Whether you seek an incredible getaway with friends or a memorable family vacation, Hard Rock Hotels has it all. Adults will appreciate modern accommodations and luxury amenities, while kids will enjoy safe, fun activities, and entertainment at Kids Club. Just off the azure waters of the Caribbean Sea, the Hard Rock Hotel Riviera Maya is nothing short of the ultimate crowd pleaser. Live it up with world-class shopping and endless style. Hit the Little Big Club™ and teen activities, or channel your inner awesome and head to Heaven — an adults-only expanse with stunning pools, lavish spa treatment rooms, and access to signature golf courses by Jack Nicklaus and Robert von Hagge. Bottom line, it's all top-shelf. Book by May 31, 2019 for travel from February 3, 2019 until December 19, 2019 and kids stay free with a minimum three-night stay in the Hard Rock Hotel Riviera Maya Family Section. 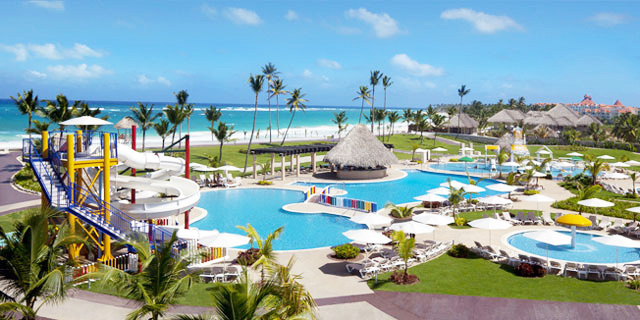 The Hard Rock Hotel & Casino, Punta Cana boasts the best casino around, exhilarating night life, tantalizing culinary options, and rooms worth tweeting about, all infused with the legendary rock and roll vibe. Book by December 20, 2019 for travel from now until December 20, 2019 and kids stay free in the Signature Family Suite room type. Experience the allure of the Pacific at Hard Rock Hotel Vallarta. Situated on a wide, gold sandy beach of Bahia de Banderas in the heart of Nayarit, Hard Rock Hotel Vallarta takes everything to the extremes. Incredible views of the Pacific coast, modern amenities, all infused with the spirit of Rock 'N' Roll. Book by December 20, 2019 for travel from now until December 20, 2019 and kids stay free in the Deluxe Family room type. Book your next stay at select Hard Rock Hotels in Mexico and the Caribbean with WestJet Vacations and kids will stay free! What are you waiting for? With vacation packages that will whisk you away from the vast stretches of soft white-sand beaches of the Caribbean to charming local gems in Europe, there is no shortage of enthralling memories to be made. Contact your Expedia® CruiseShipCenters® Vacation Consultant today to start planning your next escape! Terms and Conditions: Air Canada Vacations: *Only valid on new bookings of select packages purchased between November 5, 2018 and December 31, 2019 for departures between January 1, 2019 and December 31, 2019. Minimum 5-night stay required. Applicable to flight-inclusive packages only. Valid for any flight class cabin. ­ 1Applies to bookings made between 179 and 120 days prior to departure. 2Applies to bookings made between 119 and 90‑days prior to departure. ­ Offer can be withdrawn at any time. Subject to availability at time of booking. Not applicable to group bookings. Offers expire at 11:59‑p.m. ET on the date indicated. Flights operated by Air Canada or Air Canada Rouge. For applicable terms and conditions, visit www.aircanadavacations.com. Holder of Quebec permit #702566. TICO registration # R50013536 / W50013537. BC registration #32229. ®Aeroplan is a registered trademark of Aimia Canada Inc. ®Air Canada Vacations is a registered trademark of Air Canada, used under license by Touram Limited Partnership, 1440 St. Catherine W., Suite 600, Montreal, QC. Further restrictions may apply. For full terms and conditions, please contact your Vacation Consultant. Sunwing: *Further restrictions may apply. For full terms and conditions, please contact your Vacation Consultant. Transat: †Savings of up to $500 per couple applicable on new individual bookings on March 21 & 28 Toronto departures, March 11 Vancouver departures, and March 14 & 21 Montreal departures in hotel room category. Applicable savings is based on the regular package price and calculated before taxes and fees and reflected in advertised price. Transat is a division of Transat Tours Canada Inc., and is registered as a travel wholesaler in Ontario (Reg#50009486) with offices at 191 The West Mall, Suite 800, Etobicoke, ON M9C 5K8; in British Columbia (Reg#2454) with offices at 2175 West 41st Ave, Vancouver, British Columbia V6M 1Z6 and in Quebec (Reg #754241)with offices at 300 Leo-Pariseau, Suite 500, Montreal, QC H2X 4C2. Further restrictions may apply. For full terms and conditions, please contact your Vacation Consultant. WestJet Vacations: Advance booking required. Non-refundable and non-transferable. Offer limited and subject to availability. Offer subject to change and expire without notice. New bookings only. Blackout dates apply. Other restrictions may apply. Valid for up to two children ages 4-12 per room, per stay when accompanied by one full paying adult. Kids stay free offer not applicable at Hard Rock Hotel Cancun & Hard Rock Hotel Riviera Maya-Heaven Section. Reservations with overlapping dates will qualify, the discount will apply for nights within the travel window. Quebec licensee. Further restrictions may apply. For full terms and conditions, please contact your Vacation Consultant. Ontario travel agents are covered by TICO. Mailing address: 6085 Midfield Road, Toronto ON L5P 1A2. TICO registration number: 50018683.